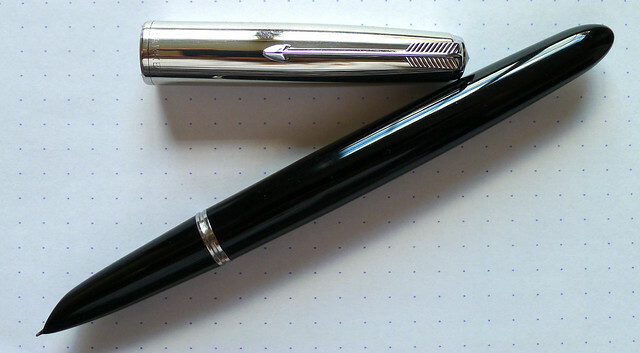 In the fountain pen world, is there a pen more well known than the Parker 51? I am not educated enough to know for sure, but in researching this pen I would have to say the answer is a resounding no. The Parker 51 saw a production run from 1941 until 1972 where it was one of the most popular pens in the US. It was a mass market pen with tens - some say hundreds - of millions produced. Chances are that if you went to your grandparents house right now you could come up with a 51 floating around in an old desk drawer. Ever since I started down this fountain pen rabbit hole I have been aware of the Parker 51, but I was not interested in vintage fountain pens until recently. I have been happy with my Pilot's and Lamy's but the more I read up on the history of some of these great pens the more anxious I get to add a few to my arsenal. The design of the 51 speaks to me. It has a sleek, minimalistic shape with a distinct hooded nib that is often imitated but never duplicated. What impressed me the most about the model that I tested from Thomas' collection is how easy it is to write with. The nib was fine, smooth, and true - a real joy in the hand. In fact, everything about the pen fit me perfectly. Thomas has sent me some incredible pens to test out (with more to come) and the Parker 51 has been the hardest to send back. I think the number one spot on my pen show shopping list is now solidified. 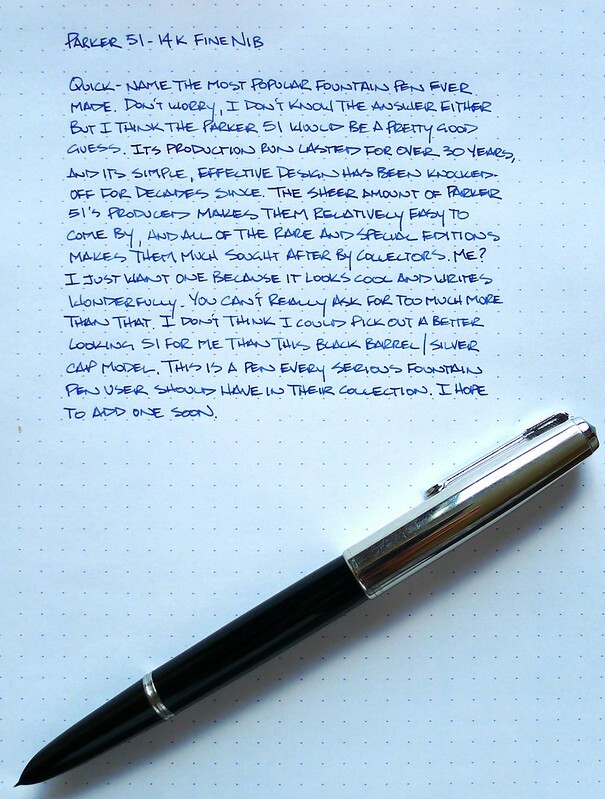 Posted on March 27, 2013 by Brad Dowdy and filed under Pen Reviews, Parker 51, Fountain Pens.